Video calling is a breeze with Amazon's new gadgets. I'm usually critical of smart home accessories. I'm not a fan of the idea of putting a camera and microphone in every room of my home and having it watch me, my friends and family. I also don't think it's a great idea to let more and more devices into our lives that a single company has control over beyond even state authorities. But, the Drop In and Alexa-initiated video call features of the Echo Spot are compellingly good. The Echo Spot review devices have arrived in our editorial office. The little brother of the Echo Show comes with a small display, simpler audio hardware, plus a small camera and a microphone array. This makes it suitable for on-demand video calling. This is only possible with Alexa devices and apps, though that turns out to be no obstacle after the first try. After several attempts to get along with the Amazon Echo family of devices, it has finally happened for me. The Echo Dot and Echo were nice attempts, but the weak speech recognition accuracy and lack of immediately apparent added value meant they never sat well with me. To truly benefit from Alexa, I would have to deal with a whole string of add-on costs, like smart lights, thermostats, locks, and so on. Sure, those add a bit of convenience, but I'm not lazy enough to see the added value to justify the cost. I'm not lazy enough for voice-controlled lighting. And that's why I never saw a good reason to buy the Echo Dot. It can't use my music streaming service. It doesn't sync with my Google Calendar. And, I don't use any of Amazon's cloud service offerings. The entire Amazon ecosystem is unknown to me, and using an Amazon device totally throws me for a loop since I have to alter all of my ingrained habits. But now, a new Amazon product has come around that gives me a whole new perspective. Initially, Amazon tried to compel us to buy their screenless Echo devices. For people that hesitated, Echo Spot and Echo Show deliver immediate added value. Thanks to their screens, the value is more obvious to those who didn't see any reason to buy Amazon's previous hardware. Once you sync your address book, you can call up all of your friends. Thanks to the finally available display and built-in camera, you can see each other, too. The best thing about it is that you can reach your friends on the go with the Alexa app since it accept calls from Echo devices. If you say "Alexa, call John Doe," it will ring on all of his devices. We were told at a press event that Amazon doesn't intend to open the feature up to third parties. So, we won't be needing a Skype, Telegram, or Hangouts skill: Amazon will keep video calling in its Alexa ecosystem. But, since the app works on almost all smartphones and has the feature available on it, and most people have an Amazon account already, there's not much of an adoption hurdle. In fact, the calling features give users fresh incentive to install the Alexa app and give the assistant a shot, since the Alexa app isn't just a companion and set up tool for the Echo hardware anymore. Thanks to their displays, the Echo Show and Echo Spot can be set up without a smartphone anyway. The Alexa app finally lets you use the language assistant of the same name, on both Android smartphones and iPhones. If it has been activated for the Echo device in question, you can simply switch on the camera via Drop In. Like an intercom system, the Echo Spot in a room can be spontaneously be activated, as if you were peeking through an open door. To avoid embarrassing situations, the Drop In feature can be switched off (with the camera and microphone) by pressing a button. Anyone who calls will just see a message saying that the camera is disabled. 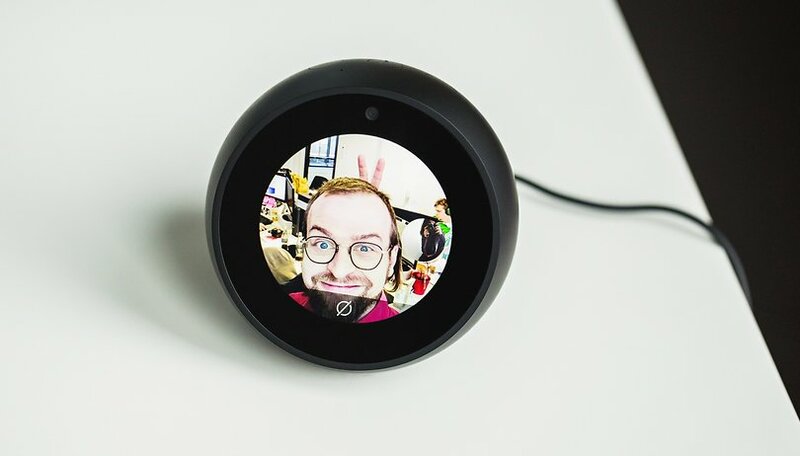 While I think the idea of Drop In for the Echo Spot in a bedroom is problematic, I can imagine placing it in common areas like a hallway, kitchen or living room. In the coming days, I will take a closer look at the new Alexa hardware. I still haven't checked out all the features, a list which has been getting longer over time. Until then, shoot me your questions and suggestions for things to include in the review of the Echo Dot. Do you already have a smart assistant at home? If so, how do you like it? Which features are missing so far? No thanks! Don't need a device always listening to me. You mean you don't have an internet-connected microphone in your pocket, like literally everyone? One that follows you on every intimate moment of your life, into every bathroom, every private meeting, and sits at your bedside? This perception is so common, and yet such logical tunnel vision.